I’ve already told you about Eco-Friendly Baby Products – EcoMom, when I reviewed the Plum/Revolution Foods products. I’m very happy that EcoMom is expanding their cloth diaper offerings! I was originally supposed to review the gDiapers (several readers have asked about them) but they were such a popular new item, they weren’t able to let me review them just yet. Hopefully soon! EcoMom has competitive pricing and offers free shipping on any $75 order every day. However, they also offer the EcoPass. The EcoPass is $99 for the year ($8.25/mo) and gets you free shipping plus 15% off of all orders! At this time, there are no restrictions on that. It’s good on both oversize and expensive items! EcoMom has a new feature, the “daily deal.” As an EcoPass holder, you would be entitled to buy the daily deals (plus new products!) before anyone else, and that free shipping would really make it a deal! Also, check out their “What Does EcoMom® Mean to Me” – Video Contest and you could win a $200 shopping spree! 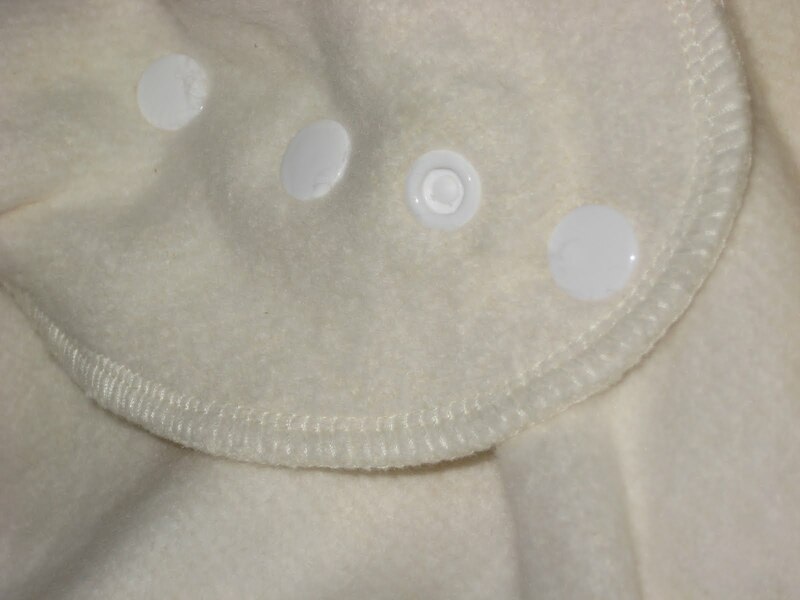 The diaper EcoMom sent me is an organic hemp fleece fitted diaper by Play All Day. The diaper is 55% hemp and 45% organic cotton fleece. I received a size medium, which fits 16-28 pounds. 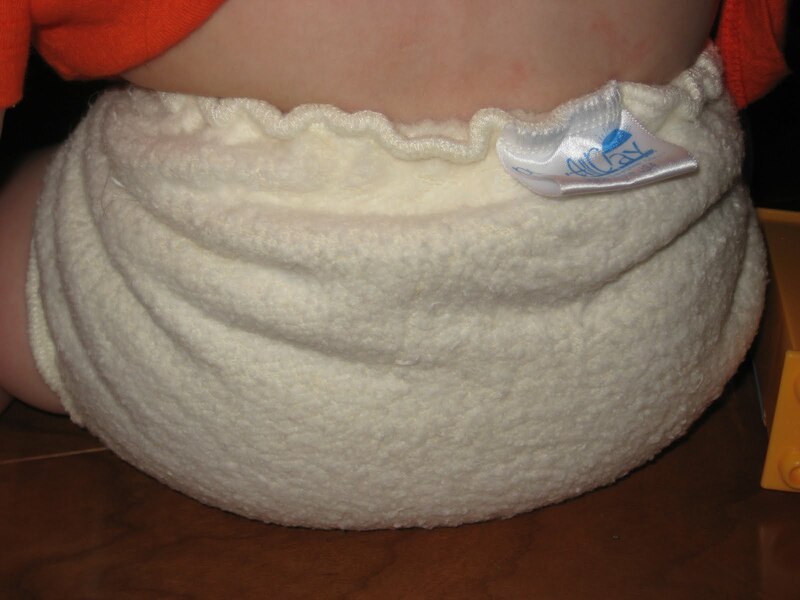 The body of the diaper has 3 layers of organic hemp fleece, while the soaker has two. Edges are all serged. The diaper is sized pretty generously to fit a wide range, but the snap overlaps help fit smaller babies. 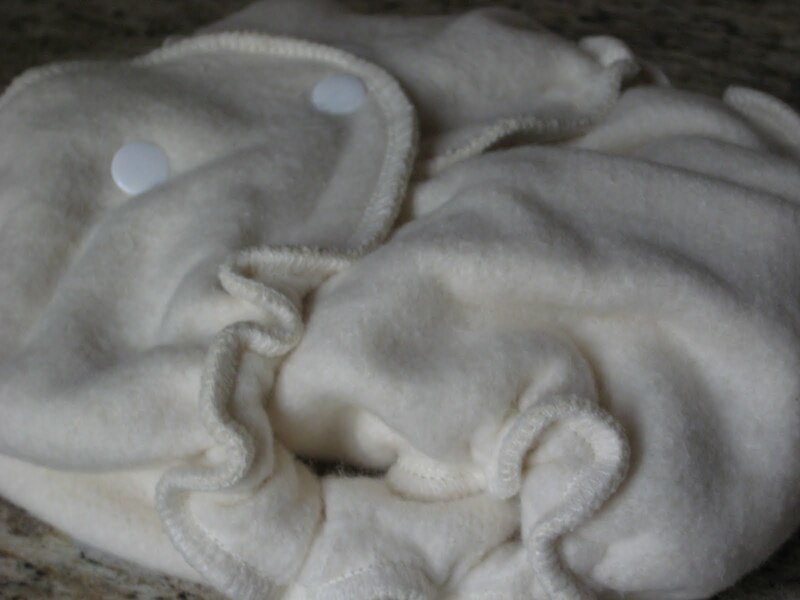 Like other hemp/organic cotton products, it needed to be washed and dried 3 times on hot before use, to remove the natural oils. It will continue to gain absorbency through 8-9 washes. 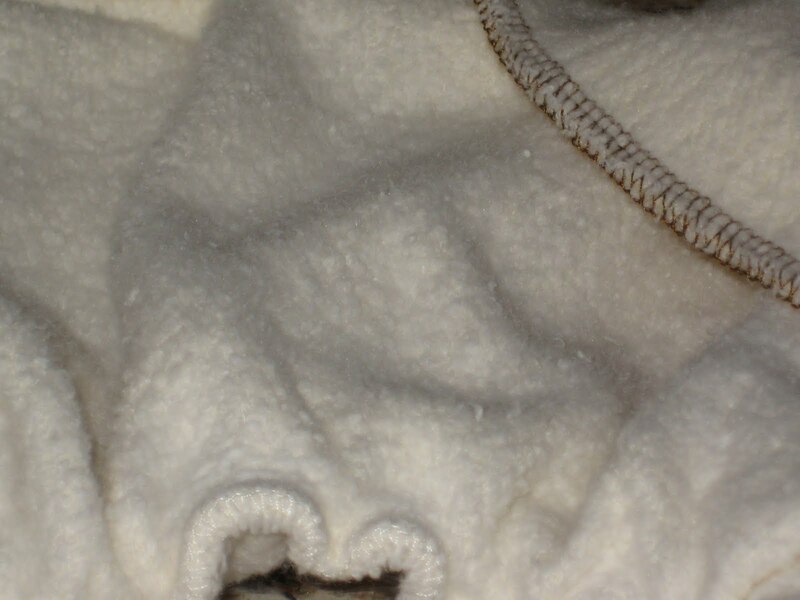 After prepping, the diaper became, um, more fleece-y looking. I am sure there is a word for that, but it escapes me! The first time I tried the diaper on my son, I didn’t double the soaker, and used it coverless. Even though my son is on the smaller side, at around 18 pounds, I got a good fit. We have used the diaper several times already. The first time, he “christened” it quickly, as he always does with new diapers. The second time, we got about an hour and a half out of it coverless, before I noticed some dampness on the outside in the wet zone. With a cover, the absorbency is great. I think this would make an excellent night time diaper with a good cover or wool soaker, possibly adding a doubler for a very heavy wetter. 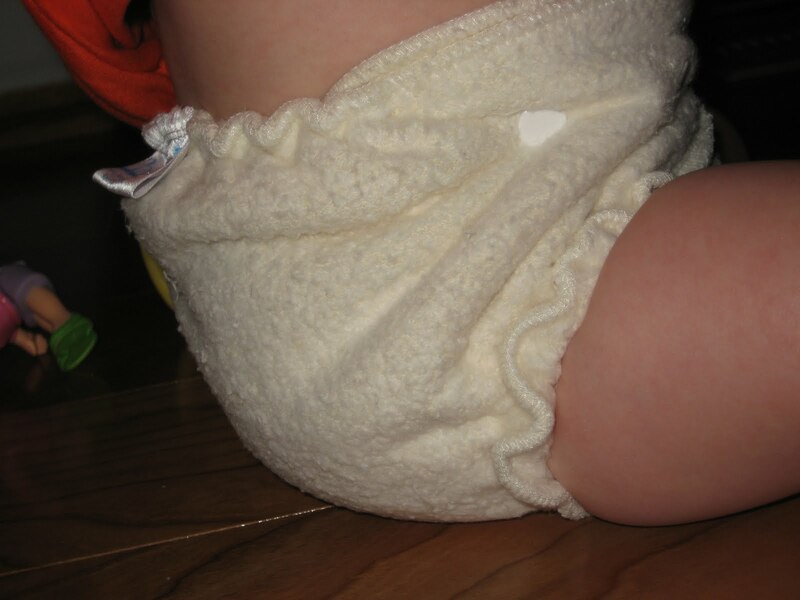 Hemp is excellent in a diaper, since it is very absorbent, without being bulky! The MSRP of the size medium is $17.50. EcoMom is offering one reader a $15 gift certificate. Use it on a diaper, or anything you like from their store! This is open to the U.S. and Canada! All of my readers may enter discount code SBBL287 at checkout and receive 15% off of your order through 8/31/10! Here’s how to enter: You may do any or all of the below. Leave a separate comment for each entry. Be sure to leave your email address in at least one comment if it isn’t visible in your profile. If you are using the anonymous comment option, please leave it in all comments. You may use the format email at host dot com if you like. 1. Visit EcoMom and leave me a relevant comment such as: What product would you like to see them carry that they don’t already? What product do they carry that you would like to see me review? What would you buy with your $15 gift certificate if you win? This giveaway is open to the U.S. and Canada. I will accept entries until Tuesday August 10th, 2010 at 9 P.M. Eastern. I’ll select a winner with random.org’s true random number generator, and contact the winner by email. The winner will have 48 hours to respond before the prize is forfeited and a new winner chosen. Winner’s email address will be shared with EcoMom, for prize fulfillment purposes only. Winner will be required to provide shipping address to EcoMom. Remember you can use discount code SBBL287 to get 15% off of your order until August 31, 2010! EcoMom graciously provided me with the pictured diaper for review purposes, and will also provide the winner with a $15 gift certificate. I was not otherwise compensated, I was not requested or required to write a positive review and all opinions are my own! >I follow EcoMom on twitter as <a href="http://twitter.com/cakeblast>@cakeblast</a&gt;. >I follow you on twitter as <a href="http://twitter.com/cakeblast>@cakeblast</a&gt;. >I follow you with Google Friend Connect! >I would like to try the 40 count Biodegradable and flushable gDiaper liners..
>Signed up for EcoMom's newsletter! >I love the Sparkle Hearts Bubbling Blooms Body Wash.
>Fan of EcoMom on FB. >I'm your fan on FB! >I want to try their CleanWell Start Pack. >I'd get a hemp diaper! >I would like to see you carry a one size fits most all in one pocket diaper (like bumGenius 4.0). >If I win, I would buy a some diapers or diaper covers. >It's so hard to decide but I'd probably get one of the many books they have. I love Barefoot books!